Hemel Hempstead Town face a massive Easter weekend as they prepare for a potentially season-defining two games in the space of three days. The Tudors have enjoyed an excellent run of form over the last few weeks – barring their 6-0 mauling at the hands of table topping Ebbsfleet United last weekend – and now sit just two points off the National League South playoff spots. Four wins from heir last six games has put them right back in the mix, two points behind both Oxford City and Gosport Borough, with a game in hand on the latter. While Oxford appear to be making a surge for the playoffs following a run of three consecutive wins, the opposite can be said of Gosport who have lost their last three games and appear to be struggling badly following the recent departures of a number of key players. Hemel will know that the final playoff spot is well within their reach if they can put their injury problems aside and produce a strong final month of the campaign - starting with tomorrow’s trip to high flying Maidstone United (3pm) and Monday afternoon’s derby clash with St Albans City (1pm). Maidstone go into tomorrow’s game as odds-on favourites with the bookies, with Hemel priced around the 5/2 mark, but there was little to choose between the sides earlier in the season when United scraped a 1-0 win at Vauxhall Road. They will not have given up hope of catching Ebbsfleet, sitting just one place and seven points behind the league leaders, with two games in hand after losing just one of their last 10 league games. However, a win for Hemel tomorrow could effectively end their title challenge, while sending out a warning sign to the rest of the playoff hopefuls that the Tudors mean business. It is then all eyes on the Easter Monday showdown with Hertfordshire rivals St Albans, with plenty at stake in that game too. 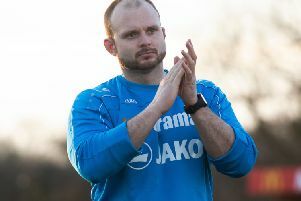 While the Tudors are challenging for the playoffs at the top end of the table, St Albans looked certainties for relegation a few weeks back – however, an excellent run of form under new boss Ian Allinson has given them real hope of avoiding the drop. Four wins from their last five games has seen the Saints move to within three points of safety, while they also knocked Hemel out of the Hertfordshire Charity Cup in a dour game at Clarence Park at the start of the month. While both of this weekend’s games look to be tricky prospects for the Tudors, manager Dean Brennan has somehow got his depleted team in winning form, and they will certainly fancy their chances of a profitable Easter period. It’s all to play for.